When I saw the preview for The Monuments Men, I was really excited. I've never been all that crazy about George Clooney, but I love Matt Damon, and the film is based on a little known tale from a famous historic event. Stories like this one, are often turned into some of the best films that Hollywood has to offer, and I was sure this film would be a can't miss. Clooney stars and directs this extremely large and diverse cast, which ultimately turns into it's downfall. When you have a large cast of talent, you need to be very careful about how you use them. In The Monuments Men, the cast is split up all across Europe, leading to short scenes, that jump from location to location far too quickly. When the crew is reunited towards the end, the film becomes much better, and in my opinion, this is how the story should have been told right from the beginning. The story centers around a community of art lovers, who are distraught about the Nazi's theft of historic works of art. As the war is winding down and the Nazis defeat is imminent, these men want to make sure that the worlds greatest works of art are protected, and their willing to risk their lives to do so. As I stated earlier, George Clooney stars and gives his usual performance. When Clooney first started doing movies, he was exciting and really gave audiences their moneys worth, but lately all he does is play the same character over and over again. Clooney is the mysterious, handsome stranger, who does a lot without saying much. Some people love that kind of thing, as for me, I find it to be lazy. If you just wanted to direct, there was more than enough talent to carry this film, and in fact, I would have preferred to see Bill Murray or John Goodman in larger roles. 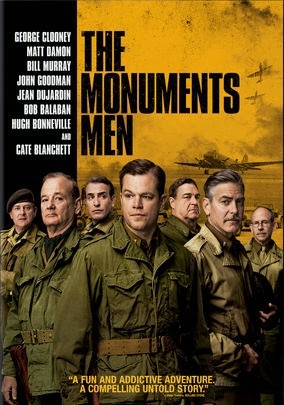 The story told in The Monuments Men is extremely interesting, but it's told in these fast paced, short scenes, that do nothing but confuse the audiences and squander the extreme amount of talent this film has to offer. Needless to say, while I thought the film was a great idea, I was far from impressed.